We tested the 150mg bottle, which did the job really well. The funny thing is, if you run a little bit of a math, you’ll see that the smaller bottle actually contains more CBD per ml and is thus the more potent of the two. Start with the 150mg bottle and go down to go up, so to speak. The only thing we will say is that, while it is effective, it can wear off faster than expected. 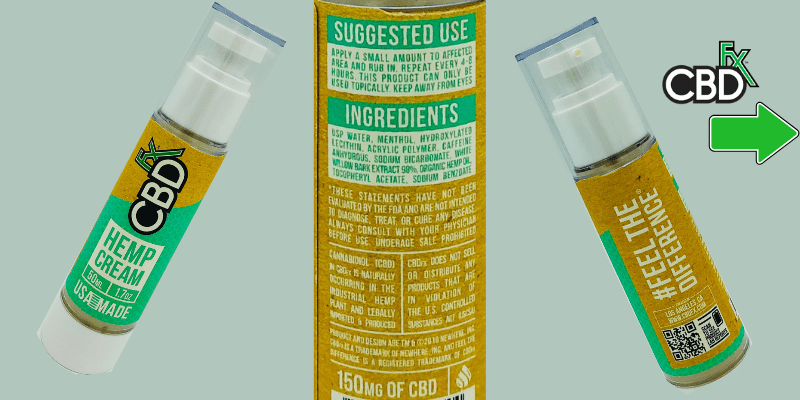 Make sure you take the bottle with you to apply more, and while this could prove costly, we think the CBDfx CBD hemp cream is well worth what you pay. Today we’re taking a look at the CBDfx CBD hemp cream. The right CBD topical can make such a huge difference in your day today, which is why we search high and low for them. We didn’t have to go far to find this one, as CBDfx is one of the top CBD brands on the market. CBDfx offers a wide range of products. Their roots are in vaping, but they’ve quickly branched out to create other high-quality CBD products, like gummies, capsules, vape pens and topicals such as this one. Offered in both 30ml and 50ml bottle sizes, the CBDfx CBD hemp cream is completely organic and contains no animal gelatin. The bigger 50ml bottle contains 150mg of CBD, while the smaller 30ml bottle delivers 100mg of CBD. It is meant to deliver relief from localized pain. In addition to full spectrum hemp extract, it uses menthol, white willow bark, and caffeine to aide in the effort. CBDfx notes that this product is pharmacist-formulated, although we aren’t sure what they mean by that, and as with their other products it is made in America. CBDfx always does a lovely job with their packaging, and this was no exception. Besides it looking professional, it’s more important that it works properly because this is a pump bottle. The last thing you want with a bottle like this is for it to be cheaply made, malfunction, and get cream everywhere. Not only would it be messy, but it would be a big waste of valuable CBD. Thankfully, the CBDfx CBD hemp cream comes with a quality pump which outputted its contents smoothly and easily. The first sensation was definitely of the smell of menthol. It isn’t overpowering, but it is noticeably there. One person on our team just isn’t a fan of menthol, so he had to hold his nose and bear it until it was absorbed into his skin. Menthol stimulates blood flow and encourages faster healing, and most of us did like the smell and found it gentle. The cream feels nice on your skin and warmly soothes as it quickly absorbs. Since you’re taking CBD cream for pain in this instance, your best bet is to apply a little bit where the pain is and wait. The effect is very quick, but hold off maybe 15 minutes before you apply more. CBDfx recommends that you repeat this every 4-6 hours, but really just go back and add more when you start to feel pain. In truth, that estimate might be closer to 2-3 hours and then the effect will trickle off. Each person will experience it a bit different, so try a little and work your way up as needed. CBDfx CBD hemp cream worked wonders. It’s not often that you find a product that really lives up to its billing, but this appears to be one of them. Every single person on our team who tried it had success, and pretty much instantly after it was applied. This is what CBD cream for pain is supposed to feel like. It worked on a strained calf muscle, it worked on an inflamed shoulder, it worked on everything. I even ended up giving some to my dad to help with his arthritis, and as skeptical as he was to try it at first, he was immediately convinced. Pretty much had that jaw-drop reaction of how quick it worked and how well. White willow bark – Known for its anti-inflammatory properties that ease the pain by permeating the affected tissue. Caffeine – Stimulates blood flow to the area, allowing healing to take place more quickly. Menthol – A natural analgesic that acts as a gentle cooling and numbing agent. CBDfx does a great job with customer support, giving you a variety of contact options. You can send them an email, call them on their toll-free phone number, and engage in live chat on their site. Responses were rather speedy, and their customer reps were friendly and helpful. Free shipping on all orders in the USA – can’t beat that! You can also track your packages right to your door directly from their site, which is always fun. This one was a winner all around for the team, and definitely a contender for best CBD cream for pain period. The CBDfx CBD hemp cream delivered on its promises and stomped out pain and sore muscles in no time flat. It also proved to be a great CBD arthritis cream, so joints have met their match. It has soothing menthol, so just make sure you don’t absolutely hate how menthol feels or smells. We tested the 150mg bottle, which did the job really well. The funny thing is, if you run a little bit of math, you’ll see that the smaller bottle actually contains more CBD per ml and is thus the more potent of the two. Start with the 150mg bottle and go down to go up, so to speak. The only thing we will say is that, while it is effective, it can wear off faster than expected. 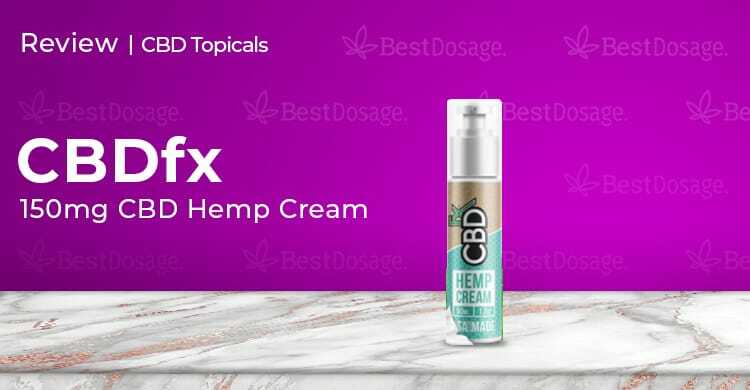 Make sure you take the bottle with you to apply more, and while this could prove costly, we think the CBDfx CBD hemp cream is well worth what you pay. We’re also happy to help bring your cost down with our exclusive 15% off coupon. Just use the coupon code BESTDOSAGE to take 15% off your entire order.